Why have I never heard of Elizabeth Van Lew before? Chiaverini has chosen quite the woman for this book and, well, I'm now a fan. Here is a plucky, unmarried woman who took on the Confederacy and, frankly, played a measurable role in the Civil War! Chiaverini has done her research and I feel that she truly capture's Van Lew's spirit in this book. She was a woman who knew the danger of her actions, but went ahead and followed her conscious. She is someone I would love to have as a friend, but would be terrified to have as a frenemy. She is part Southern Belle and part steel-cored spy. Besides the main character, there were many things about this book that I appreciated. Chiaverini does a great job of capturing the ambiance of war-time Richmond. When she describes the oppressive summer air, I could almost feel it--and it made me homesick for my days in Virginia. While not overt, Chiaverini also does something that rarely happens in wartime historical novels--she acknowledges that both good and evil can be found on both sides of the battle lines. Just due to the nature of this book, the sins of the Confederacy are on the display. However, there are mentions not only of the good among the Confederacy, but also the fact that the Union is guilty of some of the same sins as the Confederacy. While this is a very history-heavy book, it is more novel-like than Chiaverini's Mrs. Lincoln's Dressmaker and, because of that, I found this to book to have a wider appeal. That being said, a reader will have to work through loads of historical details--which can be a positive or negative depending on the reader. I do heartily recommend this book, but I would probably be a bit careful about who I would recommend this to. If you are a historical fiction fan, this book is for you! 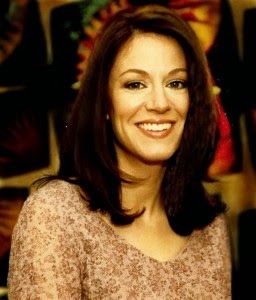 Connect with Jennifer on her website, elmcreek.net, and on Twitter @jchiaverini. I received a copy of this book in exchange for an honest review. I received no other compensation for this post. Want to read more? Check out one of the other stops on this tour! Links go to the blogs, not the specific review. Wednesday, May 21st: Peppermint Ph.D. 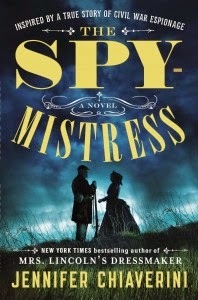 Thanks to TLC Book Tours, I am able to giveaway one paperback copy of The Spymistress to one of my readers! Please use the Rafflecopter form to enter. This giveaway is open to readers in the US (no PO Boxes) over the age of 18. The giveaway ends at midnight (Pacific time) on May 15th. Good luck!